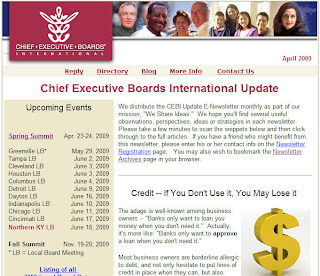 The 2009 Spring Summit of Chief Executive Boards International included an all-member Forum session on Business-to-Business E-Marketing. Members shared both questions and ideas on how to use web-based tools to enhance the sale of complex products and services to other businesses. Of course, selling consumer products (books, shoes, electronics, etc.) on the Internet has been honed to an art. But how can a business that doesn't have relatively simple products to put in an online "store" use the tools of the web to reach their customers and prospects? One of these tools, an E-Mail Newsletter, provides direct, regular "touch" of customers and prospects, reminding them of your company and your message, and refreshing their "front-of-mind" recall of same. Many companies have resisted E-Newsletter marketing, saying, "I (we) could never come up with enough content to put out an E-Newsletter on a monthly, or even quarterly basis." Application Data -- Application Notes, Field Engineering Reports, and "best practice" FAQs. Write a couple of sentences highlighting a current industry issue or situation, and then link to the article. Articles or White Papers -- Easy to re-position or recycle as current information of interest. Press Releases -- If your press releases and announcements aren't already posted on your website, post them ASAP. Then occasionally reference a press release in your newsletter. Case Studies -- You may have case studies of product applications or services you've provided customers or clients. Post these as pages on your website, and occasionally summarize one in a couple of paragraphs in your newsletter, then link to the complete case study. Blogs -- Your company may use blogging as a means of quickly capturing ideas from customers or staff. Surf your own blogs and highlight interesting posts in your newsletter. Industry or Trade Association blogs are another such source of fresh, timely content. Ask the Expert -- Perhaps your site has an "Ask the Expert" section, and hopefully you're posting the answers to these inquiries to enhance the content of your site. Occasionally pose one of those questions (or a variation on one) in your newsletter and link to the answer. Purchased Content -- There are numerous sources of newsletter content available for license. These can be ready sources of ideas in a "slow month". Trade Publications -- Your industry probably provides an online magazine. Write a two or three sentence "teaser" about one of those articles, and then link directly to the industry publication's article. The important thing about an E-newsletter is not that it's all new, original content. What's important is that it's relevant content that the reader finds valuable and usable. Don't fall for the temptation to put a lot of commercial content into your newsletter. If your newsletter works, there will be plenty of time for that. Remember, your E-Newsletter is content all its own for your website. Be sure you post an "archives" page of your past newsletters on your website -- each one becomes another page, therefore enhancing the "importance" of your site to search engines and crawlers. Check out the CEBI Newsletter Archives page as an example. If you have questions, comments or experiences to share about E-Newsletters, please click "Comments" below and share them with others.